Not having enough kids? Build more robots! This is how Japan will overcome its looming labor shortage. 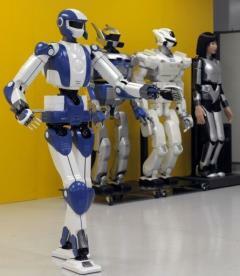 The HRP-4 robot (left) walks beside its previous models during a press conference in Tsukuba, Japan. Its makers -- Kawada Industries and the National Institute of Advanced Industrial Science and Technology -- hope the new "slim athlete" model is a step towards a robot that can help ease greying Japan's looming labour shortage. The replacement of humans by machines in the workplace took another step on Wednesday, as Japanese researchers unveiled a model they hope could lead to humanoid menial workers. Its makers, Kawada Industries and the National Institute of Advanced Industrial Science and Technology (AIST), hope the robot will be a step towards creating a model that can help ease greying Japan's looming labour shortage. "We designed a working robot in the image of a lean but well-muscled track-and-field athlete," Noriyuki Kanehira, robotic systems manager at Kawada, told a news conference to unveil the blue-and-white "HRP-4." Designed to help researchers develop models that could replace humans in repetitive manual labour, the latest "athlete" model in a near 10-year-old series updates the feminine, catwalk-strutting, karaoke-singing HRP-4C.